With continued budgetary pressures and high player expectations, every facet of operations requires careful scrutiny. This is especially true for labor costs associated with bunkers. At every level, builders, architects, and facilities plan and execute construction projects far differently than just a few years ago. Depending on where your facility is located, stormy weather can cost many hundreds, thousands or tens of thousands of dollars per event. The more bunkers on the course and the greater the frequency of heavy weather, and the annual costs can reach budget-breaking levels. So it becomes a trade-off. Continue paying for labor and roll the dice on weather events or plan a capital investment that will provide a return on investment which is elimintes the labor spending. So when professionals begin thinking about bunker improvements, they do so in cycles or blocks of time, such as 5-7 years. If a bunker improvement project costs $300,000, for example, and projected labor savings was $450,000, the decision to move forward with the project would be obviuos. Of course, each facility will have different calculations. What we do know is that bunker liners have become a standard industry practice. Over the years, we've seen a wide range of implementation methods. Some facilities invest in the best products and wrap their bunkers entirely, while other may chose hybrid product combinations or install protection only partially. What seems clear is that bunker protection is neccessary. While golf greens and tees are the greatest play features, research shows that facilities continually spend more on bunkers. Identifying the right solution that fits within a capital improvement plan and delivers labor savings can be daunting. The saavy professional addresses the bunker challenges by incorporating drainage plans and Sandtrapper to acheive high performance. The Sandtrapper product line has given course professionals the options they need to create aesthetic bunker complexes while also affording them low maintenance. Sandtrapper is recognized as critical to reaching these maintenance savings and delivering performance over the long haul. 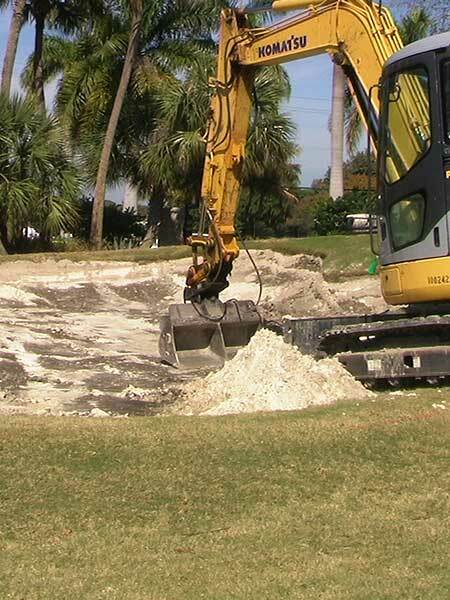 More importantly, the costs associated with bunker renovation are quickly recouped from these savings.